Asylum is a new Horror Game for Linux with some impressive visuals and graphics. 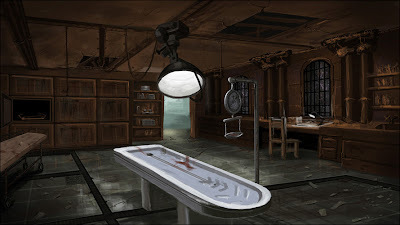 The game takes you through a chilling journey in the intricate floors of the Hanwell Mental Institute, in which unimaginable atrocities have occurred in the past. This horror adventure aims to marry cutting edge visuals with thrilling storytelling to give you the ultimate experience in fear. Asylum will not be an action game but rather an adventure game about experiencing the horror and the story, similar to Amnesia. 'Dagon' is the game engine that they have been developing for Asylum. This engine is specifically tailored for adventure games, it’s multi-platform and easy to learn. The engine focuses on portability, simplicity and performance. Now the good part is that they will open source the engine. We still have to decide some aspects of the project though, mainly if we will offer professional and dedicated support for a fee and if one or two expert features will be released to the public. Whatever we decide you can count on 90% of the engine to be freely available and open sourced, allowing you to create an adventure of similar quality and length of Asylum. Developers who are interested can expect further details soon. Asylum will be released in 2013. You can try a demo from here (at the moment only Ubuntu is supported).